Hi! I’m so glad you made it over to my blog and I’m excited to share the chicken coop with ya! Some of you possibly came from The Little Green Bean blog and if you did, welcome!!! 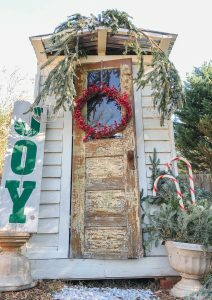 So I waited a minute too long to deck the halls of the chicken coop this year. I had a plan but I couldn’t find any fresh garland or wreaths in our WHOLE TOWN!! AHHH!! It turned out okay though because it forced me to be creative and I saved money! I found myself at our local farmers market on my journey to finding those items. They were giving their tree clippings away for free! 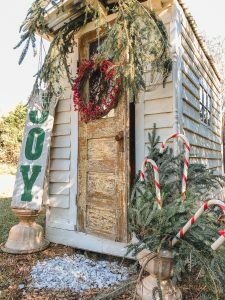 (Tip – I think most places that sell Christmas trees do this!) So Aaron and I grabbed some and threw them in the truck. 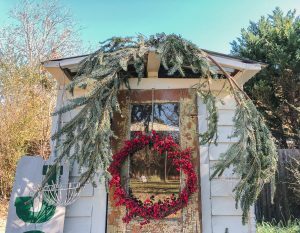 Once I got home I simply decked the coop with pine tree branches! I stuffed them on top of the coop and in a planter beside it. These pine clippings really brought life to our little coop and they were FREE! YASSSS!!!! Next up, I added a red wreath (which I’ve had since my very first apartment) and a joy sign that was out in my shed! Bam, the chicken coop is now festive!! If you found this inspirational, be sure to check out my friend at The Pickled Rose! First of all, LOVE the door! The pine brances are perfect! Love how you shopped your own goods! This looks so beautiful sweet friend. You are so creative and I couldn’t love this more. Thanks for hoppin’ with the group today. It’s been so fun.